WE SUPPORT OUR TROOPS AND COUNTRY. THE ARTIST - JOHN PAUL STRAIN Artist John Paul Strain captures the color, drama and heroism of the Civil War with a vivid realism that is unique among the nation's top-ranking historical artists. A native Southerner born in Nashville, Tennessee, John Paul Strain has studied American History and the War Between the States in particular practically all of his life. He received his formal training at BYU, polished his professional techniques as an illustrator for the U. Department of Energy, and soon afterwards entered the field of historical fine art, prints and posters. His work met immediate success and was showcased at a premiere gallery in the Rocky Mountains. Acclaimed for his paintings of the Old West, he eventually moved to Texas to work full time in the field of historical art. His early art, prints and posters depicting Civil War subjects produced the same enthusiastic response as his Western Art, and in the 1980s John Paul Strain began to concentrate on the Civil War. Few artists in the field have gained such widespread popularity so quickly. His art, prints and posters are now acclaimed among collectors, who prize his studies of Lee, Jackson, Forrest and other Civil War leaders, as well as his scenes of conflict and pageantry. His distinctive artistic style, which combines bright colors and contrasting shadows, and his devotion to historic authenticity have dramatically increased his popularity. Today, his original art is displayed throughout America and among collectors of fine art limited-edition Civil War prints. Artist John Paul Strain has become an American favorite. "Jackson meets Little Sorrel" John Paul Strain S/N Limited E dition Studio Giclee Canvas. Hird of Four Prints in the "Gods & Generals" Series. In the spring of 1861 Col.
Jackson was sent to the Confederacy's northern most point, the town of Harpers Ferry, to take command of the troops there and secure the armory and arsenal. Jackson's job was to organize and instruct the eager men ready to defend Virginia. Jackson's appearance was at first a little disappointing to the soldiers who did not know him. He was described as wearing his faded Virginia Military Institute uniform, with a blue cap pulled down concealing his features. A day or two after Jackson's arrival, an eastbound livestock train was seized, and a number of horses were recruited to the Confederacy. The horses were taken to the river for water, near the picturesque landmark where the Potomac and Shenandoah rivers meet. Jackson, being without a good mount, picked out two of the horses with the help of Major John Harmon. One of the horses was a powerful, large sorrel, and the other gelding was small and well rounded. Within a day Jackson found the larger animal skittish with a jarring gait, while the smaller sorrel had a smooth and easy gait with an even temperament. And so began a relationship between horse and rider, that would become one of the most recognizable partnerships of the war. They would soon be known as General Stonewall Jackson and his horse Little Sorrel. I enjoyed depicting the moment when Jackson and Little Sorrel first met. Little Sorrel had a special character that seemed to fit with his owner. Outwardly he wasn't considered a flashy horse, but like Jackson, he proved his worth not by how he looked but by how he performed. Little Sorrel had so much heart and endurance, that Jackson's staff often had to remind him when their own horses were played out. Little Sorrel also had quite a personality. It was said that often the horse would lie down on the picket line with General Jackson feeding him apples. After surviving the war, Little Sorrel was described as a rascal with a mouth that could undo latches, let down bars, and liberate every horse in the barn. And like his earlier master, he would lead his command into new fields of opportunity, removing fence rails if need be. Also available in these formats. All Limited Edition prints are signed and numbered (S/N) by the artist and include a Certificate of Authenticity. Limited Edition prints are restricted to a certain number. For example, if 400 prints are made from an original painting, once theyre gone, thats it. There is no limit to the number of open edition prints of a particular painting. Thats why Limited Edition prints are more expensive and more valuable to collectors than "open" edition. Rare objects are more valuable. An Artists Proof (AP), generally, is the first 10% of the Limited Edition prints that come off the press. If the Limited Edition is 400 s/n, there would be 40 APs. This status is noted on the print. Collectors prefer APs because their value increases even more than a Limited Edition as time goes by. A remarque is a pencil drawing done in the white border area of an art print. The subject of the remarque is usually determined by the artist. Each remarque is a piece of original art which adds to the value of the print by making that particular print unique and exclusive from the rest of the prints in the edition. All Limited Edition artwork is subject to availability at time of order. 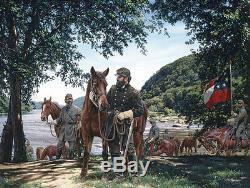 The item "Jackson Meets Little Sorrel John Paul Strain Civil War Studio Canvas Giclee" is in sale since Sunday, January 22, 2017. This item is in the category "Art\Art Prints". The seller is "airplanesandmore" and is located in Flower Mound, Texas. This item can be shipped to United States, Canada, United Kingdom, Denmark, Romania, Slovakia, Bulgaria, Czech republic, Finland, Hungary, Latvia, Lithuania, Malta, Estonia, Australia, Greece, Portugal, Cyprus, Slovenia, Japan, Sweden, South Korea, Indonesia, Taiwan, South africa, Thailand, Belgium, France, Hong Kong, Ireland, Netherlands, Poland, Spain, Italy, Germany, Austria, Bahamas, Israel, Mexico, New Zealand, Philippines, Singapore, Norway, Saudi arabia, Ukraine, United arab emirates, Qatar, Kuwait, Bahrain, Croatia, Malaysia, Chile, Colombia, Costa rica, Panama, Trinidad and tobago, Guatemala, Honduras, Jamaica, Antigua and barbuda, Aruba, Belize, Dominica, Grenada, Saint kitts and nevis, Saint lucia, Montserrat, Turks and caicos islands, Barbados, Bangladesh, Bermuda, Brunei darussalam, Bolivia, Ecuador, Egypt, French guiana, Guernsey, Gibraltar, Guadeloupe, Iceland, Jersey, Jordan, Cambodia, Cayman islands, Liechtenstein, Sri lanka, Luxembourg, Monaco, Macao, Martinique, Maldives, Nicaragua, Oman, Peru, Pakistan, Paraguay, Reunion, Viet nam, Uruguay.